Anyone who has battled illness knows the importance of a strong support system. In our fight against pediatric brain cancer, we started Lauren's Circle of Strength. Marianne explains how the String of Strength helped inspire this tremendous network of family, friends - and even strangers. "Each bead on the string of strength represents an experience during the journey through a child’s life with cancer. 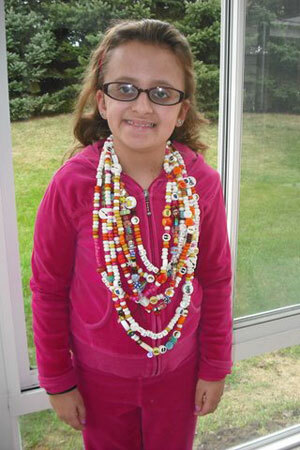 Some beads symbolize the most unpleasant of experiences such as pokes, surgery, hair loss, chemo and hospital stays. Some beads signify the most beautiful moments, friendships and memories made during the journey. Every bead added to the strand is a tangible and growing testament of the strength, courage and perseverance of the child who earns it. "Lauren started her string of strength about 5 years into her diagnosis. As I sat with her and her nurses and social worker in clinic on the day she started her strand, we tried to piece together the major events that had transpired over the years in order to help her “get credit” for the things that had already happened. As we went through the list, Lauren became more and more excited to collect a giant strand of starter beads. "'Hair loss, oh yeah, I need that one. Transfusion, yes!! Gimme those!'" "I, on the other hand, became increasingly distressed as I watched the necklace grow. By the time we left clinic that afternoon, Lauren had a smile almost as big as the strand of beads around her neck hanging down to her waist, and I had a giant lump in my throat. "As the weeks went by, and the string of strength grew, it also started to grow on me. I started to see it for what it is - the truth and reality of Lauren’s and our family’s life with cancer and all the good and bad that goes along with it. "We keep Lauren’s string of strength hanging on the giant bulletin board in our kitchen, where we can all see it everyday. She wears it with great pride on special occasions, like an exquisite and priceless piece of jewelry. It is her badge of courage, a symbol of her resilience, optimism, and her never quit attitude." Josh Knoble and Creighton Morris, two junior Board members of LFG, created this wonderful video/documentary on the the camp and foundation. Laurens First and Goal from laurens first and goal on Vimeo.